My Finland themed triumvirate of reviews continues. No, this wasn’t planned, but with a name like “Rytkonen”, you know I’m going to roll with whatever the twisted souls still dwelling in my homeland can hurl at me. The debut full-length from Finland’s Maveth, “Coils of the Black Earth”, is killer. I could end it there and make you do all the work dear reader, but I guess that isn’t why I’m here. My first impression of this album was indeed just that… “Killer”. Atypical and evil riff style. Burly mid-ranged death vocals that bare no resemblance to anyone in particular. Excellent use of varying tempos. The intensity reigns in Maveth’s world, as does their pension for smart guitar lines that are paned both far left and far right, so you can easily hear both guitar parts even through the menacing wall of distortion. The tracks possess direction and never sound tired or out of worthwhile ideas which says a lot for a release in this style, clocking in at nearly 1 hour. Well rounded riff ideas exhume bizarrely memorable tremolo speed harmonies, ushered further to the forefront of their attack by crushing power chord rhythms and other deft musical weapons in their arsenal. 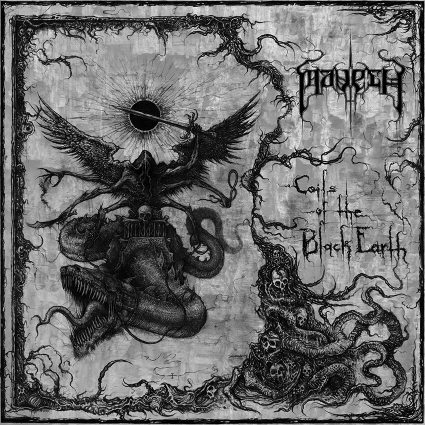 As Maveth carve through mid-paced, then blasting, back to slower rhythms, their attack is so expertly considered, each track ends up being unpredictable, being hurled even deeper into the pits by Christbutcher’s unforgiving and burnt out vocalizations. The typical Swedish guitar tone threw me a little…but beneath that they have enough originality to craft some really nice dark segments. Cool LP. This entry was posted on November 13, 2012 at 8:02 pm and is filed under ALL REVIEWS, M-reviews.You can follow any responses to this entry through the RSS 2.0 feed.You can leave a response, or trackback from your own site.